If anyone who went to the Kilburn show (or any of the other UK gigs) wants to jot down their recollections for the booklet please email us. If you have any ideas for a limited edtion CD version send them in. A number of Mk 3 releases have appeared since LIVE IN LONDON first appeared, but this is still the only official recording from the UK available, and it captures the feel of the tour admirably. On the whole it's a great gig too, with just one or two off-moments, and while they do ramble at times during SPACE TRUCKIN', it is of the time (and has some powerful work within it). There's a preview of the original album release in Issue 25 of DARKER THAN BLUE / STARGAZER, and reviews in Issue 26. 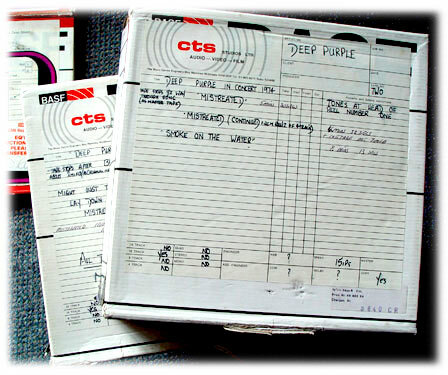 The various Live In London tapes have been taken out of storage. There is the full 90 minute show on five 16-track 2" reels (see photograph). These were copied in 1982 at CTS (De Lane Lea's old studio in Wembley), possibly from the remaining 4-track reels supplied by the BBC. The BBC quickly assembled a first version, broadcast as a specially extended 90 minute "In Concert" programme on June 6th. This may have been broadcast in quadraphonic, for which you needed a quad amplifier and speakers (this might also explain the 4 track reels the BBC had). The BBC did experiment with the format for a short while. The BBC later rebroadcast the gig but in the more usual 60 minute "In Concert" slot. This was achieved by dropping the 34 minute long "Space Truckin'" but to fit the different time slots, there were some other changes. The original 90 minutes version had some short edits. For example, the second broadcast version of YOU FOOL NO ONE has, during Blackmore's 'blues' solo section, an extra minute of Blackmore picking tunes which is missing from the first airing. There was also a bit missing from the start of MISTREATED and the drum solo. If anyone has spotted any other differences, do let us know. 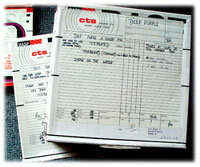 There was a BBC Transcription Record cut from the second broadcast which has been the source of vinyl and CD bootlegs. For the 1982 vinyl version of LIVE IN LONDON, EMI used the first broadcast, so as well as getting the material into shape for the 2CD version all the edits need to be restored. If the encore was recorded, it is now lost for good. Initial work on the tapes will probably take place in April at Abbey Road. Where is the missing Kilburn encore? Don't blame the BBC. Gary Hurley has written to confirm that the band didn't play one. Gary recorded the show for himself on a small Philips tape cassette recorder, and says they finished with "Space Truckin'". "I can certainly confirm that the complete Kilburn show WAS recorded, but the 2" 16-track tapes were re-used about 2 or 3 years later to record a Wishbone Ash show with! I know, as I one day peeled off the labels and was confronted with the Purple labels still underneath." Gary Critcher. Thanks Gary! For younger Deep Purple fans, Gary used to work for the BBC and was instrumental in helping us get the two In Concert shows released officially. His tales of BBC shelves groaning under the weight of warping transcription records which he was told to throw out haunt me to this day! "Concerning the differences, please remember to restore the original concert intro, "This band's been called the loudest band in the world, they didn't say they're the best band in the world. Put your hands together please, burn with Deep Purple."" Angelo Mutinelli. The show was introduced by the BBC DJ with the words above. We wanted to keep this on the vinyl 'Live In London' back in 1982, but amazingly someone at EMI thought it sounded like he was putting the band down. He is the only person ever to have thought so! We will do our best to restore this to the new edition. This is a good idea Harrie, I'll see what turns up when we listen to the tapes. I'm not sure what the economics are but we can ask. EMI have booked the studio to sort the tapes and prepare the mix in June. They will also look at the possibility of a 4.1 mix at the same time for SACD. 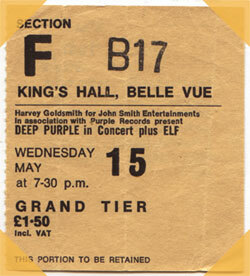 We're trying to find copies of tickes from shows on Deep Purple's 1974 UK Tour. Click the ticket on the right to see what we've got so far. Abbey Road have spent a day on Live In London, and copied over the 4 track tapes. The good news is that it seems to us as if the bits missing from tapes used for the vinyl are here, as is the full "Space Truckin'". The strange news is that the separation is weird, with vocals, drums and bass all on one track. Happily as this is a mostly instrumental number, it'll not present too many problems. Peter Mew at the studio is now going through the stereo tapes to check all those and preparing listening copies so we can work out exactly where any "lost" bits are prior to cutting these back into the final CD production master. Some more tickets from the tour have come in from fans, and we've been and photographed the fabulous Kilburn State Gaumont for the package too, with a member of the DPAS having penned us a short history of the venue for the sleeve notes. These old cinemas might seem invincible, but developers are trying to get permission to demolish the magnificent Art Deco Odeon in Kensington this very week (and don't get me started on the 1960s Commonwealth Building opposite, for which Blair's mob are prepared to change the law on listed building status so they can raze it to the ground). The only British tour 74 gigs we are missing tickets images for now are Southend Kursaal, Norwich (first night), and Stoke On Trent. Can anyone help? If you can add to the collection, please get in touch. Can anyone help? If you can add to the collection, please get in touch. All the missing bits have now been timed and the list is back with Abbey Road. One bright spark in the DPAS (hello Martin) imported the various audio versions into a PC so the sound waves could be compared visually to help double check the work. Abbey Road will now compile a finished version of the show for us to listen to. We've asked them to go steady on the compression as I know this does concern a lot of fans. Assuming this gets done in September (which is a busy time as studios finish up major Christmas releases) a release around November does look very probable. Which is good; I wasn't looking forward to chewing pointy hat for Xmas dinner... In the meantime, Mike Garrett at the RB Fanclub (Lincoln) has been down and photographed the Kursaal venue for the A-Z.